“The strong reader—whether actor, critic, director, artist, political polemicist, or whatever—expands the range of signification within the text; the strong text expands the horizon of the reader. We make the classic our own, bring it into our world; but we also give ourselves up to it, enter into its world” —Jonathan Bate, Shakespearean Constitutions: Politics, Theatre, Criticism 1730-1830. In 1997, seven people on a East London council estate decided to write a novel together that would be composed of stories based on their own lives and would appropriate the form of the novel to promote their circumstances and outlook. 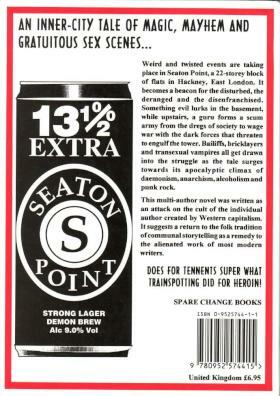 They produced the novel Seaton Point (1998), composed of intersecting stories of eccentric characters, vampirism, debt-collectors and demons, working-class culture and urban Gothic parody, set in and around a block of flats in Hackney. It is a novel which resists many of the attributes of the postmodernist literary novel as we understand it – and falls stylistically and conceptually close to the work of Tony White. In an interview with 3AM Magazine, Tony White explains how he has found the experience of writing for a specific audience expectation and deadline to produced not only different approaches to completing the work but concretely different experiences of writing. This attention to the changes in the fundamental experience of writing brought about by writing for rigid stricture, such as the strict ‘realism’ required for his contribution to the All Hail the New Puritans, or to a particular intertextual frame of reference, as he did in his novel Road Rage!, drawing on Stewart Home’s early novels (and the Richard Allen skinhead pulps which inspired them) produces a Modernistic avant-garde effect. Like these works Seaton Point demonstrates an interest in the performative quality of writing as an activity which produces its own logic; for the writers of Seaton Point, the collectivity and social activity informs every aspect of the text. When finally written down, oral folklore such as the Odyssey is allocated a single creator – the mythical Homer – in order for it to be understood by those of a limited outlook. Thenceforth, the work is immutable, it is killed as an evolving story: to add to it now would be to invite accusations of presumptuousness from outraged classical ‘scholars’. We are a corrective to such cultural imperialism. In this work, the process is transparent and we lay no claim to it. But we do lay claim to our culture. We are not postmodern or ironic or any of that self-indulgent Western nonsense. We mean it. The uncertainty surrounding our conception of the historical Homer makes him useful for resisting literary canons in their contemporary form: there is considerable doubt as to when, precisely, he lived; whether his work was the production of a single person or a group; whether the poetry of ‘Homer’ was compiled from many anonymous sources; whether ‘Homer’ is a real name or a title or alias for a man or group, and so on. Seaton Point operates within a framework of critique of the place of the novel as a product of isolated individualism alongside other important international publications such as the novels Q by ‘Luther Blissett’ and 54 by ‘Wu Ming’ (‘Wu Ming’ comprises the four authors who were Luther Blissett plus one more—the latest book by Wu Ming to be translated into English is Manituana (Italian, 2007; English , 2009)). The thrillers, Q and 54 are based in historical periods of upheaval—the Reformation and post-War Italy/Cold War Europe respectively—and interrogate individualist and collectivist political positions through dramatic events. As novels, they resist the individualism associated with novel-writing in some very strong ways. Both Q and 54 emphasise their existence as objects within social exchanges first through their collective production and second through the CIP pages where both novels state: ‘Partial or total reproduction of this book, in electronic form or otherwise, is consented to for non-commercial purposes, provided that the original copyright notice and this notice are included and the publisher and source are clearly acknowledged’. Such international avant-garde declarations in favour of the social exchange of literature outside of commercial avenues are a powerful context to situate Seaton Point against. The contemporary artworks that antagonise copyright and the scholarly studies that interrogate it participate in a deliberate and reasoned engagement with an overextended legal regime that may still be reined in. But because these oppositional works are launched from within cultural and academic markets where copyright not only dominates but partly predetermines subject-positions and conditions of utterance, they cannot fully exit the thing about which they would speak. The counterdiscourse to strong copyright, in other words, is a symptomatic discourse. But of course, this is only a partial impression and only concerned with one aspect of Saint-Amour’s book; the work of Luther Blissett and Wu Ming is not primarily aiming at this academic milieu, while Seaton Point is operating in an arena which has been largely invisible to academic discourse and on the margins of contemporary literature. To term it a ‘symptomatic discourse’ is to reduce the impact of agency within the cultural exchanges of literature. Left radical voices like the Luther Blissett Foundation and the Wu Ming Foundation are operating from a perspective where the role of agency is central, they are not setting out merely to antagonise copyright as a construct but aim to offer up a system of literary and intellectual exchanges of ideas which are freer in their designation of ‘fair use’ for cultural producers as people with creative agency. The seven authors of Seaton Point are taking up a position which gives the experience of collective creative activity absolute primacy even over engagement with academic or commercial literary concerns. Literary Production—Social Production—Experience of Literature: Or How to Avoid Writing Equations in Literary Theory. There is something whimsical about Seaton Point. Although it is a novel which takes a militantly materialist stance on the act of literary production, it still manages to evoke a genuine sense of play as a meaningful activity. Literature is an exciting playground in this novel; literature is also an unrestricted space: Seaton Point demonstrates that literary forms have rules and expectations (the writers show that they are aware of them) but it also asserts very strongly that the act of producing literature can do with these as it sees fit in the moment (i.e. the logic of the text evolves during the act of writing). It effectively folds up Trotsky’s discussion of literature to cut through the argument. Trotsky carefully distances literature from overt political activity on one hand, emphasising that the rules governing literature are necessarily literary rules, not political ones, whilst asserting on the other that all art necessarily reflects the political and social conditions governing its production—literature and art always allow political critique of their time to be conducted through them because they hold the conditions of their production within themselves as artefacts which will persist beyond their moment, but to hold them to a single ideological position is to miss what makes them literature.The inevitable space opened up by Trotsky regarding politicised literary theory remains: How do we square literary aesthetics and politics? ; and: is it really desirable to do so when reading literature? Seaton Point takes up a position which resonates directly with this question and in arguing for literature as process comes up with a kind of anarchic aesthetics of permanent revolution which neatly moves the debate on. In resisting any form of closure the novel asserts not only that its condition as text supersedes political and aesthetic debate (by being always a potential sphere where both, and more, can be played out to multiple conclusions—a Barthesean free play of meaning) but also that the experience of using literature as an unlimited dialogic form (no single author, no copyright) will, as a social act, resolve such debates by giving them a limitless space in which to speculate with new ideas and grow into new forms. This has parallels with the analyses of ‘defamiliarisation’ in Russian Formalism, the value of Fantasy as ‘secondary creation’ in Tolkien, and even the importance of Science Fiction’s ‘cognitive estrangement’ in Darko Suvin but for the comparison with the council flat setting of Seaton Point I would like to consider the rather more domestic and, in some respects, more eccentric case of Nathaniel Hawthorne’s ‘Custom House’ introduction to The Scarlet Letter as literary theory. He reminds his reader of the concrete social substance of the interaction between writer and text and reader and text, it acts as a shorthand theory of literary production: literature happens where readerly and writerly imagination coalesce like homely objects seen in unusual light to make the familiar strange and the strange familiar. Because Hawthorne is writing before the emergence of the modes and genres that the others are used to refer to, his co-mingled Actual and Imaginary, mutually ‘imbued with the nature of the other’, is usefully fluid conception for a text which respects no genre or formal distinctions. Hawthorne’s metaphor also indicates a sense of the irreducible pleasure of literary creation, something that the seven authors of Seaton Point assert to be of vital importance: literature has certain concrete conditions of production (Hawthorne actually worked in a Custom House) but it supersedes them through its transformation in the imaginary (he spins a yarn of discovering the story of Hester Prynne) which then becomes something else again for its readers (The Scarlet Letter as text becoming a reading experience). Seaton Point is the name of an actual block of flats in Hackney, the seven authors of Seaton Point are each taking the peculiar combination of ‘Actual’ Seaton Point and ‘Imaginary’ conventions, forms and narratives in different directions: for one contributor it the combination becomes something like a contemporary version of Kafka; for another, something using Horror motifs more like Anne Rice or Stephen King; while for a third a clearly satirical take on the modern comic novel of class, akin to the Punk-inflections of Martin Millar’s Good Fairies of New York rather than, say, something by Martin Amis. The meeting of all of their different approaches within a single text causes the novel to undergo a shift into a kind of excessiveness of representation which becomes the reading experience of engaging with the text Seaton Point. Like canonical Modernist texts, Seaton Point aims to go beyond a single formal register, reaching out towards a conception of the contemporary world that can include dreams and fantasies as part of the actually existing social circumstances of modernity within its social vision. The ambitions of this slim text are Joycean: they aim to rewrite The Novel; their collective efforts are asserted as a methodology to be emulated in formulating a critique of contemporary fiction and the history of the novel in general. The narrative strands which make up Seaton Point criss-cross several lines of genre, employing an understanding of populist modes and atmosphere building but subverting each one within the overarching anarchic aesthetic. Like the texts I discussed in the previous Werewolf article on contemporary fiction, particularly Hal Duncan’s Book of All Hours and Iain Sinclair’s City of Disappearances which I think make very interesting analytical comparisons, Seaton Point is defined by its excessive use of formal conventions as a resistance to codification and as part of its aesthetic attempt to overcome limitation and grasp its moment. It employs more genre markers than its brief form would be expected to support but, in playing them against each other produces a compelling sense of wider circles and networks of interaction; it reaches out beyond the constraints of form and expectation in terms of genre, as its CIP page reaches out beyond the internationally recognised conventions of publication. This is more than a gesture; it is a poetics of contemporary literature: it proposes a political ethics of literary production and a manifesto for literary renewal—not bad for a book of only 160 pages. Its accessibility is the first part of its power. 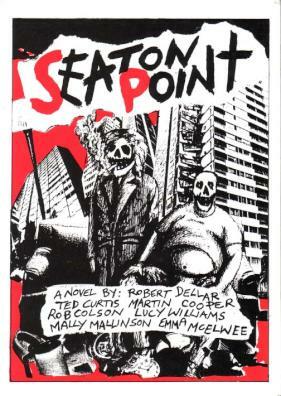 The unifying principle of Seaton Point is that of stylistic collage derived from the DIY aesthetic of Punk Rock (this is particularly clear from the front cover illustration above). The styles of the novel’s chapters and sections are absurdist one moment, gritty realist the next, always maintaining a clear awareness that both postmodernist pastiche and gritty realism are affected positions in the production of literature. The campness of his vampirism is counterpointed by a cultural knowingness; Lee Christo’s camp performance of gender, acting a drag artiste is reflected in the performativity of the potted critique on the commodity system issuing from a sympathetic predatory killer. Alone in the lift, he speculates on the possibilities of an existence he cannot remember: ‘Was he married at all? Did he have a house, a nice car and satisfying job or career, any children? […] What would it actually be like to have all or any of these things, to walk in the streets or the woods and smell the air or hear the birds sing and the soulless, destitute lost souls of nowhere wail inconsolably?’. Like a thought experiment becoming a narrative, his speculation becomes a fantasy, which in turn becomes a concrete world—but we have to wait for other narratives to unfold before we see how this turns out. The alchemist’s appropriation is part of the conjuring of his magic; the alchemist can stand for the function of genre conventions in the novel as a whole: diversity and multiplicity form an excess within the totality of the whole, reaching beyond any single mode of representation and beyond the singularity of the text as a bounded whole, feeding into its counter-copyright declaration. This excessiveness manifests the text’s production by multiple writers and its demand for continuation as a dialectical progression. Dialectics operates in several ways within Seaton Point. By appealing to multiple forms for its different character-arcs the novel asserts its own position beyond any of the forms; the stylistic unity of its totality supersedes the combination and contradiction of its elements. Similarly, individuality is asserted and subverted simultaneously within the framework of the text. All seven authors are named but the introduction tells us that all seven authors took and ran with each other’s creations in the writing process, so the unity of style and author known as ‘voice’ is also called into question within the novel: we cannot link any one style or any one narrative purely to any one contributor, the expression of individual ideas takes place within the group dynamic and is inseparable from it; we must think of them dialectically as a group, greater than the sum of their parts—any or all of them might have taken part in refining and re-writing any single sentence of the other’s work. As the characters and their stories can function as short parodies of representational modes, from Realism to the Gothic and, for want of a better term, Kafkaesque allegory, so the plots and sub-plots of the novel as a whole, working through these disparate and non-consonant styles, stand for the endeavour of its writers working dialectically through the limitations of any one particular perspective. The form of the novel reflects and reflexively engages with its collective production. An important precedent for Seaton Point is Surrealism, and in particular the promotion of collective activity by the Surrealist group—for Annette Shandler Levitt in The Genres and Genders of Surrealism, the collage aesthetic is central to understanding Surrealism. Surrealism is in many important respects, a critically misunderstood term but an important one, since it forms a foundation stone of the contemporary avant-garde. There are several critical aspects of Surrealism as a practice that have been the subject of recent reassessment which are pertinent here: chief among them its collaborative nature and then, extending from this: the place of women within the movement; its various relationships with colonialism and postcolonial critique, through the interaction of Francophone Caribbean writers and poets with the French Surrealists; and its precise periodicity as an international avant-garde movement given that its practitioners underwent various splits and breaks, and moved off in different geographical and philosophical directions from one another. The anthologies of Surrealist work in Surrealism Against the Current and Surrealist Women in particular emphasise that the Surrealist project was strongly interested in devising responses to contemporary modernity through new collective aesthetic practices. In the case of many practitioners this then led them towards strong left radical political positions; Surrealism as a whole retains a strong sense of this, tempered by the idiosyncrasies of the ‘outlaw’ Surrealists who broke with the group because of opposition to communism. We can suggest that from a post-Surrealist position, individualistic aesthetic idiosyncrasy is not in opposition to the group activities of literary production but a necessary and complementary part of it. An important collective practice of Surrealism was a game which could take either literary or artistic forms, which they dubbed Exquisite Corpse, after one of its early attempts produced the sentence “The exquisite corpse will drink the new wine”. In a game of Exquisite Corpse the players each take a part of a piece of paper and write either the beginning, middle or end of a narrative/sentence, or draw the head, body or tail and legs of a creature. Each contributor is usually allowed to see a small part of the end of the previous contribution, to allow them to be unified; the resulting chimerae are products of individual flights of fancy and collective rules which produce some startling fantastical combinations. This book does not have a point at which it is authored, but a vector, these lines between. I email you three hundred words, then you email me three hundred words. And there is an error correction protocol: if the receiver doesn’t receive within forty-eight hours after sending, the receiver sends the next three hundred words too. This form produces a series of free-associative digressions and explorations on the communication of ideas. The pressure that each writer feels to fulfil their side of the obligation inherent in the game becomes part of the play itself and hence part of the exchange, a theme to be explored; similarly the speed of communication and the occasional failure of communication becomes part of the subject of the game, hence the title. Seaton Point shares clear aesthetic principles with Speedfactory as an Exquisite Corpse fiction, but by its polemical introduction and ‘no copyright’ statement, it places the further demand that it be not only read as a practical manifesto for playing literary games, but also offers itself for potential unauthorised collaboration by its refusal of the discourse of international copyright. 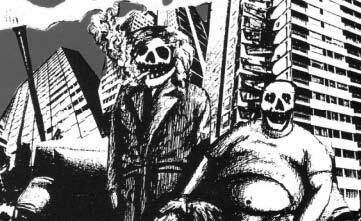 It can be seen as a return to the underground or counter-culture traditions of making and doing for the sake of human interaction, an essentially anarchist poetics. As a novel, Seaton Point demands an attention to the collective social aspect of individually consumed texts and stylistically it promotes a radical approach to reading which encourages literary game-play. In both aspects it urges us to understand novels as imaginary spaces shared between its multiple contributors and diverse interpretive communities of readers. It invites speculation about how it might exist differently as a novel and as a literary project. Alternative Seaton Points might exist; we could have, for the sake of argument, a Seton Point for Scotland, a Seatown Point, Jamaica Queens, NY for the US, a Seatoun Point: Aotearoa, for New Zealand or a Seaton Point Road, South Australia (or other state or territory-specific variants—or the principles of the novel’s creation might be taken up and put to use in a way not related to the original). These possibilities and more are immanent in the formation of the original novel as an open collaborative text, to be borrowed or adapted along with the concept, or departed from entirely according to the ideas of the contributors. Seaton Point demands that we become conscious of the diversity of potential influences on textual production and, in ultimately denying absolute authority to any final, finished version of the novel it throws the game open to its reader. Seaton Point is not merely revelatory of the conditions of its literary production, it is militant and revolutionary in its politics of literature, and highly suggestive for the future reconception of literature in Britain, and for contemporary literature in general—and it manages all this while still being an irreverently entertaining read. Bate, Jonathan, Shakespearean Constitutions: Politics, Theatre, Criticism 1730-1830 (Oxford: Clarendon Press, 1989), p. 210. ‘Introduction’ to Seaton Point by Rob Colson, Martin Cooper, Ted Curtis, Robert Dellar, Keith Mallinson, Emma McElwee and Lucy Williams (London: Spare Change Books, 1998), p. 5. Hawthorne, Nathaniel, The Scarlet Letter (‘The Custom House’) ed. by Ross C. Murfin (Boston and New York: Bedford/St Martin’s, 2006), p. 46. Levitt, Annette Shandler, The Genres and Genders of Surrealism (Basingstoke: Macmillan, 1999). Richardson, Michael and Fijalkowski, Krzysztof (eds) Surrealism Against the Current (London: Pluto Press, 2001). Speedfactory, Kinsella, John; Cohen, Bernard; White, Terri-Ann; Wark, McKenzie (Freemantle, Western Australia: Freemantle Arts Centre Press, 2002), Frontispiece, p. .